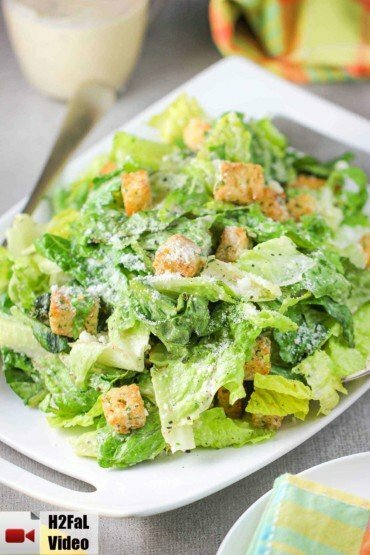 This post is sponsored by Village Farms, but the recipe, photographs, and opinions are 100% ours. 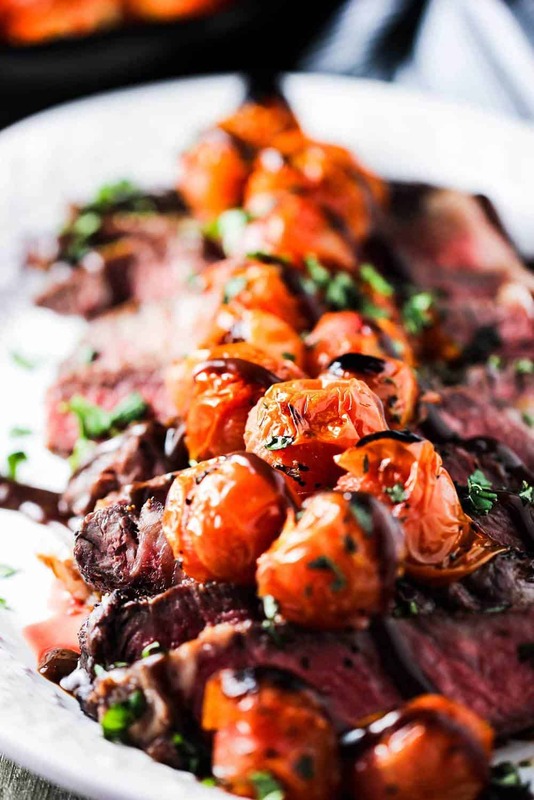 Seared Ribeye with Blistered Tomatoes and Bordelaise Sauce is one of those dishes that you serve when you’re looking for something special. We were lucky enough to partner up with Village Farms, who produce some of the best tomatoes, cucumbers and peppers that we’ve ever encountered. We wanted to elevate some beautifully marbled ribeye steaks that we recently picked up from our local butcher. It didn’t take long to decide to turn to Village Farms Cherry No. 9 Fall in Love tomatoes to takes these steaks to new heights. Cooking them in a little olive oil with fresh thyme, sea salt and freshly ground black pepper brings out their incredible flavor even more than ever. We love to finish them off with a quick visit under the broiler to give them just a little charring and blistering. Oh, yes. These are just the ticket for our Seared Ribeye with Blistered Tomatoes and Bordelaise Sauce! These tomatoes are so sweet and incredibly juicy. The taste is practically intoxicating. And we just love the vibrant red color. So, why not elevate the taste even more? We’re on a roll here! How about a sprinkling of freshly torn basil? Perfect. 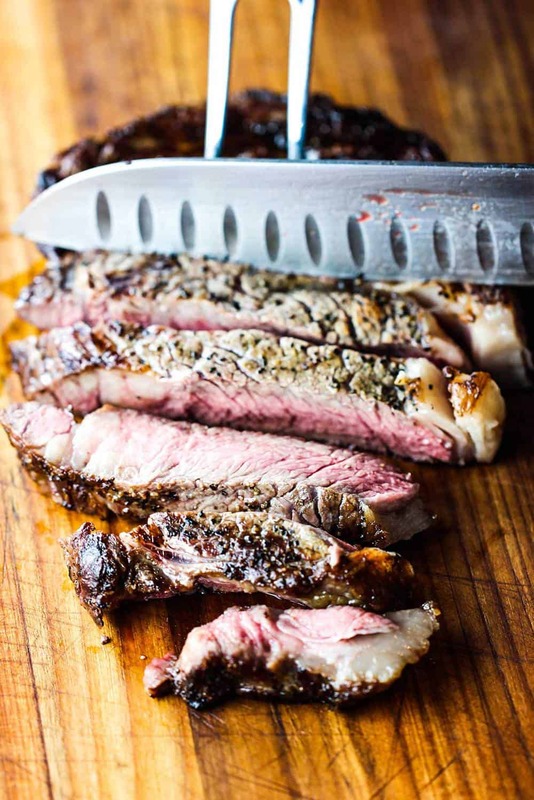 We’re crazy for ribeye because of all the delicious marbling. Place the steaks on a hot grill, and that marbling turns into melt-in-your-mouth delicious flavor. You can certainly sear these steaks in a piping hot cast iron skillet, too. An ideal temperature for ribeye is a nice medium-rare at 140°F. Go up to 155°F for medium. Let the steaks rest for 10 minutes before slicing. This lets the juices re-distribute. By this point, we are getting giddy knowing this Seared Ribeye with Roasted Tomatoes and Bordelaise Sauce is almost ready! The final touch to this incredible Seared Ribeye with Roasted Tomatoes and Bordelaise Sauce…is…you guessed it…homemade Bordelaise sauce. 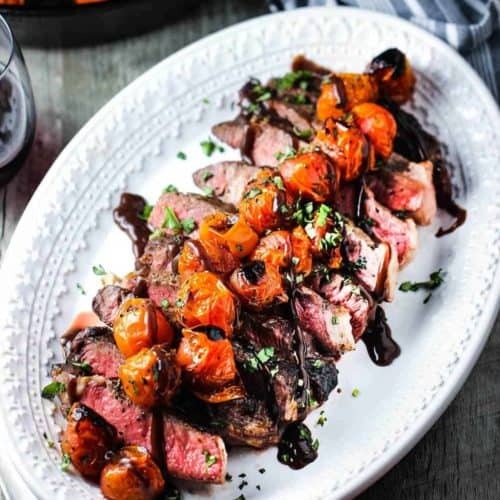 Bordelaise is a French sauce from the Burgundy region that is an incredible reduction of robust wine (i.e., Burgundy), demi-glace, and fresh herbs. You can purchase veal and/or beef demi-glace online, or at Williams-Sonoma. This sauce is the perfect addition to the savory ribeye and flavorful roasted tomatoes. We love everything about Village Farms. The produce is so fresh, timely, and just simply delicious. Village Farms tomatoes, cucumbers, and peppers are available in many well-stocked grocery stores throughout the U.S. and Canada. Their vegetables are so fresh, it’s literally like getting tomatoes from your local farmer. What could be better than that? These Cherry No. 9 Fall in Love Again Tomatoes are incredible on their own, but they also can take a dish like our Seared Ribeye, and put it over the top. 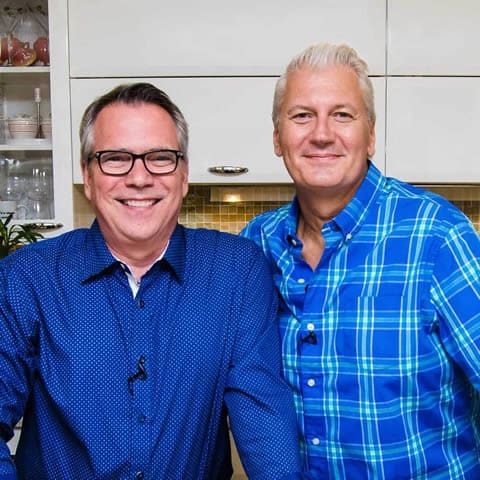 If you’re looking for a dish for Valentine’s Day, or any special occasion, or heck…just a down-right delicious meal…you have come to the right place. 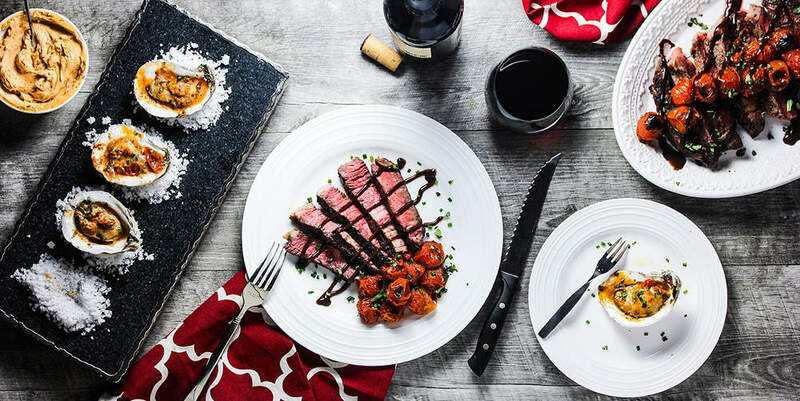 This Seared Ribeye with Blistered Tomatoes and Bordelaise Sauce is one you and your special companion will be talking about for days to come. And if you really, really, really want to impress, you should also make our incredible Grilled Oysters with Roasted Tomato Butter. These pair beautifully with the Seared Ribeye with Blistered Tomatoes. 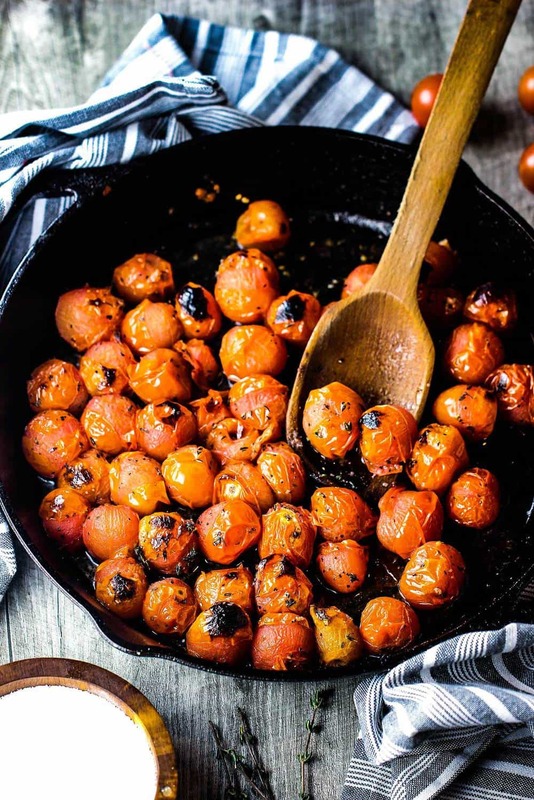 Both recipes highlight incredible tomatoes from Village Farms and you can taste the difference. 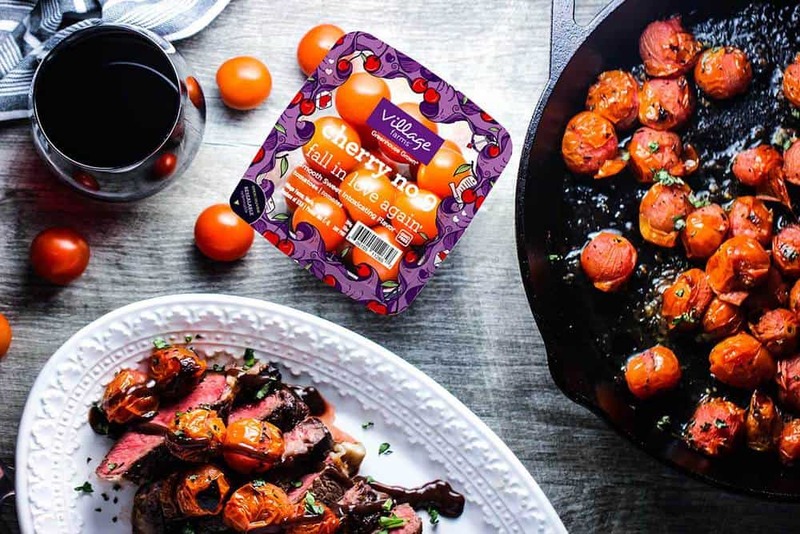 A meal this good deserves the best, which is why we without doubt use Village Farms. 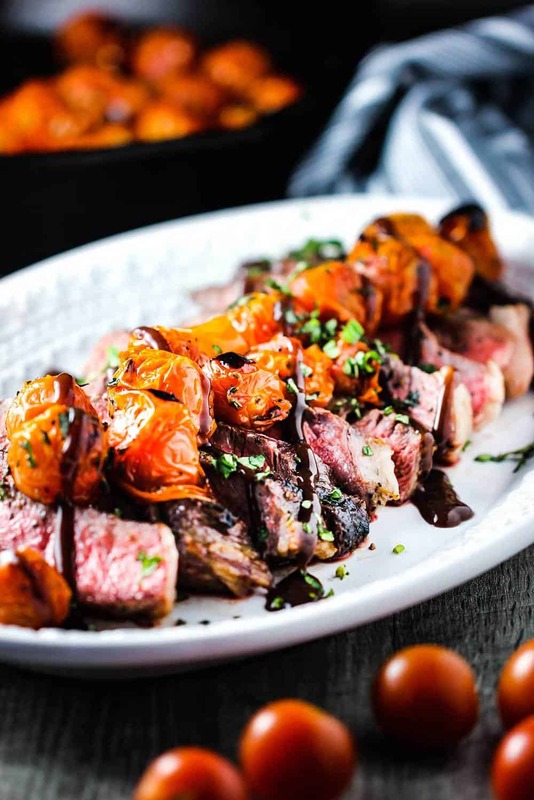 This Seared Ribeye with Blistered Tomatoes and Bordelaise Sauce is a stunning dish that is without doubt sure to please. 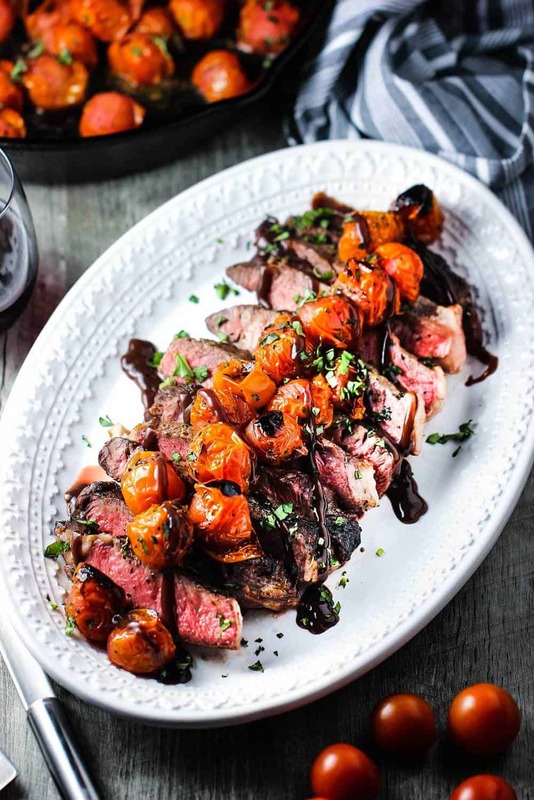 The steak matches perfectly with the deeply flavorful roasted tomatoes and succulent bordelaise sauce. A truly special dish. 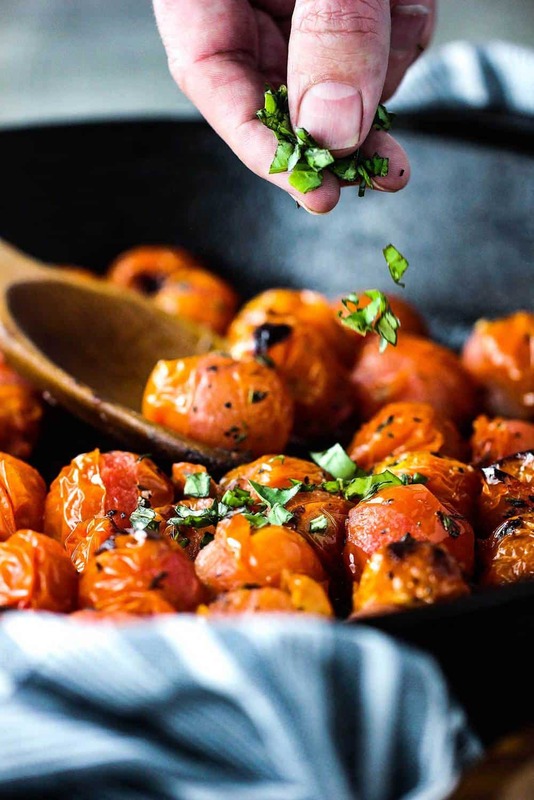 Add the tomatoes, thyme and a healthy pinch each of salt and pepper to the skillet. Return sauce to the pan and stir in the demi-glace and 1/4 tsp each of salt and pepper. Cook for 3 to 4 minutes, stirring often. Add the beef stock one tbsp at a time until the consistency is smooth and slightly syrupy. Turn off heat, cover, and set aside.